The following is a guest post by our friends over at Travel With Bender! 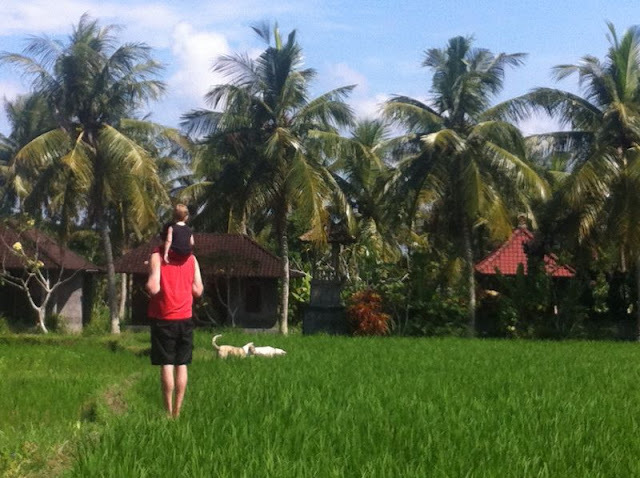 Over the last decade we have traveled to Bali, Indonesia eight times. I’m trying to convince Bohemian Travelers that it is a must visit place! Persuading the children is simple because the power of their relentless nag often sways an adult. Here are ten things that can get any child very excited about a visit to Bali. With over 17 slides this park is amazing. The kid’s area has recently been upgraded and even toddlers will have a blast in here. The fun did not stop at the kid’s zone. We all loved the lazy river which flows around the park through jungle and monkey temples. You just sit in a tube and let the tide carry you away. 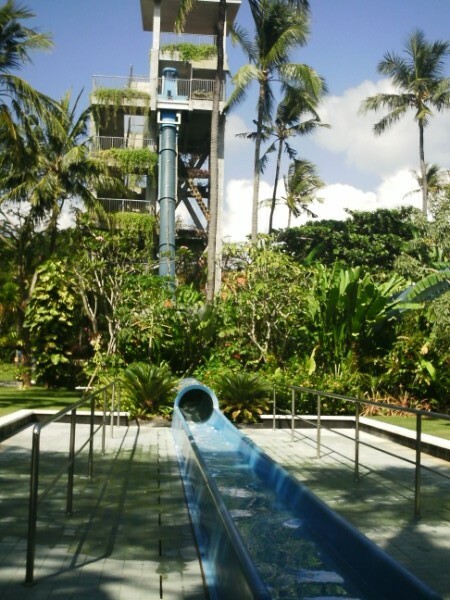 It’s so great after climbing the 80 steps to the slides a few times just to float along. The parking is limited, but if you arrive early you will not have any issues. We parked there at 9:30am and didn’t leave until about 6pm. First to arrive, last to leave. Free parking. Tickets are: Adult: US$31, Child: US$19 (2 - 12 years old). Hours of Operation: Mon-Sun 9am-6pm. Tip:You can get cheaper tickets at the little tour booths (Adult - $25, Child $17) left of Waterbom. First thing on most tours, and there are many, is a visit to a coffee plantation to try out several different coffees and enjoy a nice breakfast. After breakfast the actual tour begins. However, don’t be afraid to ask for a personalized tour. We skipped breakfast and started the tour earlier in order to finish earlier, because of the kids. Most of the tour is downhill and the majority of the time you are pressing the brakes not the pedals. Sure there were a few uphill sections, but nothing worth worrying over. The whole thing was fairly simple and so scenic. Amazing greenery, rice fields, locals waving hello, little villages, crazy motorists, breathtaking palm trees and the constant breeze and smell of freedom. It was such an adventure, one that I would highly recommend. Tip: Do not be fooled by the many bicycling tour operators. They all run the same route with the same bikes and use the same guides. The 350,000 rupiah ($35) tours offer you lunch. The 150,000 rupiah ($15) one does not. In Ubud paying an extra 200,000 rupiah per person for lunch, well that’s nonsense; you can find meals for 13,000 rupiah ($1.40). Peekaboo is in Sanur. It’s a giant indoor playground with everything a kid could want; books, instruments, swings, slides, playhouses, toys, ball pits, cubbies, everything! They even do classes and they have a café with free Wi-Fi for the adults. It is roughly $9 for a 3-hour visit per child, adults free with child. You must wear socks, but they do sell them for $1 if you forget. The classes also cost money and range in price. On previous visits to Bali we had stayed at the Bali Dynasty Resort. It is a great hotel with family rooms, kids club, 3 pools, many restaurants, markets and a great location in South Kuta, minutes from Waterbom. Recently they did some work to the kid’s pool and reopened it with a big, kid’s water playland. The new water park is fantastic. Not only is the original large slide there, but a bucket and many other mini slides. Entry is free; if you are not staying at the hotel then just bring your own towel. Tip: Stay Thursday night for Satay night at the H20 restaurant. It is a satay buffet with pork, beef and chicken satay sticks with a peanut sauce that I’m still drooling over. Another section had breads and salads. Another section kids favorites, chips, veggies, sausages, etc. And lastly the dessert bar with strudel, tarts, fondue and ice-cream. We all had a great feast and the kids ate so much food. It set us back 170,000 rp ($18 AUD) each and the kids were free. Opens at 6:30pm and towards the end of our meal they put on a dance show in which the kids became part of the act. It’s a great arvo/evening out. So many different colored parrots, flamingos and birds were on display to enjoy. There is a great restaurant where they offer photo opportunities with some of the star birds and also houses a giant play area. Books, coloring, ride-ons, doll house, it is fabulous. The kids played for an hour while we enjoyed a very relaxing lunch. Prices were a bit more then a typical café, but not bad. $5 Indonesian food. $4 kids pizza. Free cokes with all meals. Tip: Included in the price is a reptile park next door. You get a personal tour guide and even get to hold iguanas, komodo’s, tortoise’s… anything. $23.50 for adults. Children 2 – 12 $11.50. Kids under 2 free. On entry you can enjoy a comfortable bus ride through the jungle to the park. On offer are lots of animals to see, and for $3 you can even feed bananas to an elephant. More over you can take a small bus ride meant to replicate the safari through “India,” “Africa,” etc. The lion restaurant has windows overlooking the lion enclosure where a lion could be sleeping right next to you. It’s a pretty awesome view, however the food is average and the price is steep. The water park is a little run down. But the kids still loved it. Tip: The adult’s pool is very tropical and I highly recommend bringing your swimmers to cool down after the hot safari. The fun park looks more like a deserted carnival ground. There are maybe 7 rides total, some operating, others not. Not too much fun for the adults, but my toddlers loved it. I don’t know if it’s a work in progress or just a work not completed. The normal adult price is $45 US per person, under 3 free, over 3 same price. But if you call them and reserve a ticket, you go to another line and the ticket is $40 which includes entrance to the safari park, marine park, waterpark, and fun zone Pram hire is $10. 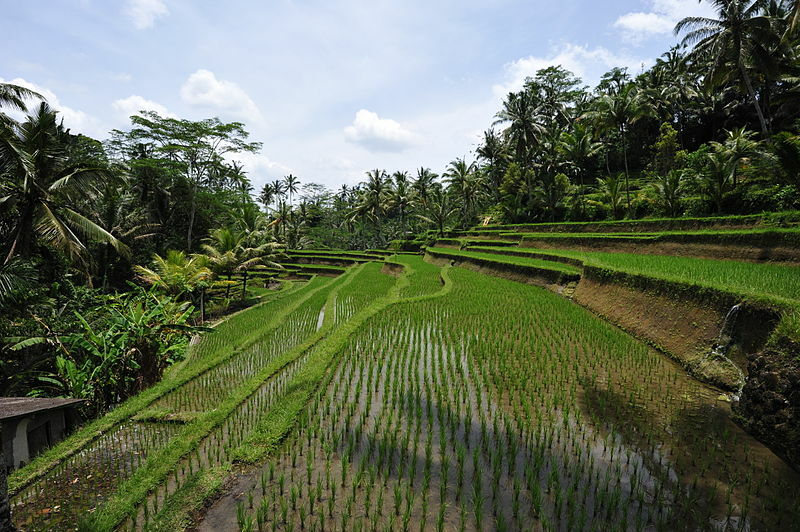 Anywhere in Ubud you will spot the amazing rice paddies that dot every horizon. Some places run tours, however you can simply walk one by yourself. Take off your shoes, get your feet nice and muddy and simply admire the beautiful scenery while listening to those squeals of delight from the kids as they squish through the mud. The park is small, but just right for kids. You can ride elephants and camels. And for the coolest experience you can buy some meat to feed a tiger. The photo opportunities are numerous and unique, with tigers, bears, crocodiles and other animals in the restaurant setting. You take a number and when you are called you go up, get your photo taken and then sit back down to keep enjoying your meal. The cost is US$24 per adults, $12 per child 2 – 12 years. Family tickets are available. Tip: There are quite a number of steps at the beginning so be careful with those strollers. Head to Nusa Dua and jump on a jet ski. 2 jet skis for 15 minutes set us back about $30. The guide is on the back the entire time. You get life jackets and the kids are safely tucked in front. 15 minutes crashing through the beautiful waves on the beaches of Nusa Dua is worth every penny. You can also find many other attractions along the beach; parasailing, banana boats rides, or glass bottom boats to turtle island. Take your time and enjoy it all. This neat little playground is great fun. The price is close to a Western indoor playground at $10 each, but with many added benefits. Not only does it have an indoor play ground complete with trampolines, bungee jumping, jumping castles, slides, etc, but out back is a climbing yard with rock climbing, lapels, crow’s nests, etc. Down the side is a water playground for kids to run around once they are all hot and sweaty. If you are not convinced already, please visit our blog to discover some of the top things you can also do without the kids. Now that’s fun! We rented our house, found a dog sitter for our dog, packed only 3 suitcases and now this family of four are traveling the world. 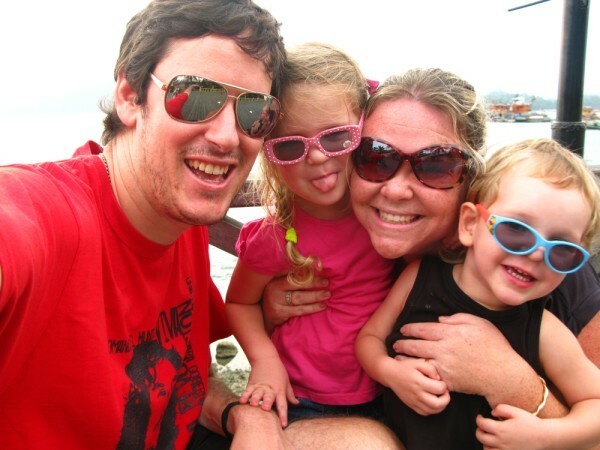 Leaving our Australian home in May 2012, with a 2 year old and a 3 year old, we were determined to make a lifestyle change beneficial for our entire family. It’s an open-ended, unplanned round the world trip discovering amazing places for toddlers (we have fun along the way) that you can share by visiting our family travel blog, Facebook, Twitter, or Pinterest account. We look forward to bumping into you around the world. I thought Bali is popular only as a wedding designation. You have mentioned many activities which could be done with our kids. My next family would be to Bali. 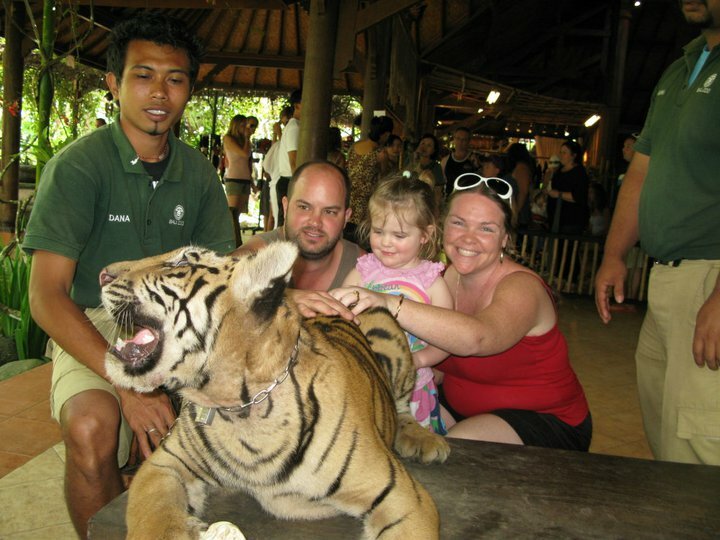 There is so much to do in Bali with your family. You wil love it! Enjoy! I think you had a great family vacation in Bali. I love the rice paddy walk. Need to try it when visiting Bali next time.